Most of us are confident that to avoid osteoporosis and many health problems additional calcium supplementation are required. Due to the large-scale advertising, calcium intake and supplementation has grown immeasurably, but the incidence of osteoporosis are not reduced, but even increased. A striking proof of this is in the following fact: that the highest percentage of osteoporosis is observed in the United States, despite the fact that there, most in the world people drink milk and consume the greatest amount of calcium supplementation. It turns out that an increase in calcium intake not only eliminates the deficiency of this mineral, but also exacerbates the problem. The main problem to fight against osteoporosis is not only to compensate the lack of calcium, but also not to lose that calcium which is already in the body. 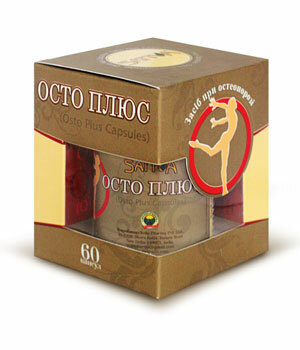 Sattva Osteo Plus capsules - is an Ayurvedic herbal remedy to prevent osteoporosis and to aid in fractures. Sattva Osto Plus capsules is an Ayurvedic herbal formulations which includes traditional plants such as Laksha, Ashwagandha, Arjuna, Nagbala, Hadzhori, Guggul, also contains Praval Pishti of very high quality. Sattva Osto Plus capsule prevents bone erosion, maintains bone density at menopause, helps to strengthen the metabolism of osteoblasts (bone forming cells). Sattva Osto Plus capsule is effective in fractures, torn ligaments, muscle tension. This is an excellent natural remedy for the treatment of osteoporosis. It helps fill the bone calcium in the appropriate places. People who have a weak bone structure, can also use this supplement to increase the density of bone mass. Sattva Osto Plus capsules useful for children in the first years of life, because it strengthens bones. It is a preparation for the regular intake in osteoporosis. Effectively relieves pain and swelling in fractures and sprains. Promotes rapid healing of fractures of any type in any part of the body. Promotes normalization of blood flow and reduce inflammation. Useful for patients with diabetes. It is used to treat different types of skin diseases. Helps eliminate toxins and maintain a healthy metabolism. Contribute to the rejuvenation of the musculoskeletal system. Laksha - Sacred Ficus (Ficus religiosa) - Laksha is a rubber-like resin obtained from the tree of Sacred Ficus so-called kino or gum Ficus is a large tree from the family of banyan trees. The resin and the bark of this tree are described in the ancient Ayurvedic sources as the best natural antioxidant. Since ancient times, people used a decoction of the bark of this tree for quick fractures healing. Laksha helps to link calcium with a bone tissue. Arjuna (Terminalia arjuna) is a deciduous tall tree that belongs to Terminalia family. The extract of Arjuna tree bark has amazing healing properties and used in Ayurvedic medicine to treat osteogenesis imperfecta, osteopenia (low bone mineral density) and slowly healing fractures. Recent studies confirm that Arjuna plays an important role in improving calcium metabolism and increasing the bone density. Arjuna is a natural source of calcium, and promotes rapid healing of fractures. Ashwagandha (Withania somnifera) is also known as Indian ginseng. Translating from Sanskrit “Ashwagandha” means “Horse power”. It revitalizes and provides the strength to the body and improves its resistance to injuries. Makes the body more resistant to the physical or mental stress. It is the most famous natural adaptogen and anabolic. Helps to speed up healing of fractured bones, improves levels of calcium in bones, provides strength and improves bone density. Active alkaloids, such as vitanloid and vitaferin, work as natural steroids without causing any side effects. It permits to increase muscular and bone strength. Ashwagandha has strong anti-inflammatory action. Nagbala – (Grewia hirsuta) - a group of plants known as Bala, classified in Ayurvedic medicine as a plant to increase resistance and strength of bones. There are many types of Bala, at least 5 types has similar properties. But it is a Nagbala (Grewia hirsuta) which is considered the best to enhance bone strength and muscle strength without side effects. Guggul - Mukul Myrrh Tree (Commiphora mukul) – the milky juice of its fruit is known as Guggul resin. Guggul is used in Ayurveda for treatment of osteogenesis imperfecta, bone erosion, low bone density and all types of arthritis. Astisamhari – Cissus quadrangularis – this remarkable plant has an alternative name Hadjori, which in Sanskrit means “connecting joints”. Astisamhari is evergreen climbing shrub with thick quadrangular four-winged succulent stem about 1 cm in diameter. Astisamhari is rich in vitamins and antioxidants, especially vitamin C and beta-carotene. Praval Pishti - Coral Calcium (Sorallium rubrum) of the highest quality - Sattva Osto Plus capsules contain’s Coral Calcium of highest quality from the Indian Ocean. This powder is rich in natural calcium, which is able to prevent the loss of calcium from bones. This is a very important addition in osteopenia and low bone density. Sattva Osto Plus capsules are an excellent formula for rapid healing of fractures, with a decrease in bone density, with pain due to fractures, with osteopenia and osteoporosis. Increase your intake of foods high in calcium include dairy products, whole grains, such as wheat. Use more fresh seasonal fruits and vegetables. Sacred ficus (Ficus religiosa), Astisamhari (Cissus quadrangularis), Arjuna (Terminalia arjuna), Ashwagandha (Withania somnifera), Nagbala (Grewia hirsutа), Guggul (Commiphora mukul), Coral Calcium (Sorallium rubrum). Osteoporosis, fractures, sprains, osteoarthritis, low bone density, bone pain, weakness of bones, arthritis, sciatica, bursitis, muscle pain or cramps, Tunnel syndrome wrist, myositis, muscle tension, swelling of the joints, fibromyalgia . Hypersensitivity of the components of the drug, pregnancy and lactation.